Lamin Saidy, Sohm Lower Basic school's acting head, has had a great response from our supporters to his letter of thanks to us, published, below, in February this year. 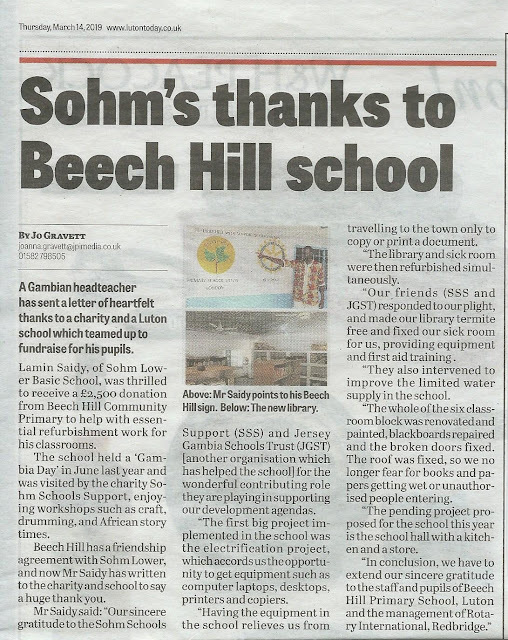 The Luton Herald, the main newspaper circulating in the catchment area of Beech Hill , the school with which Sohm Lower Basic is twinned, published the article below summarising Lamin's letter to us. 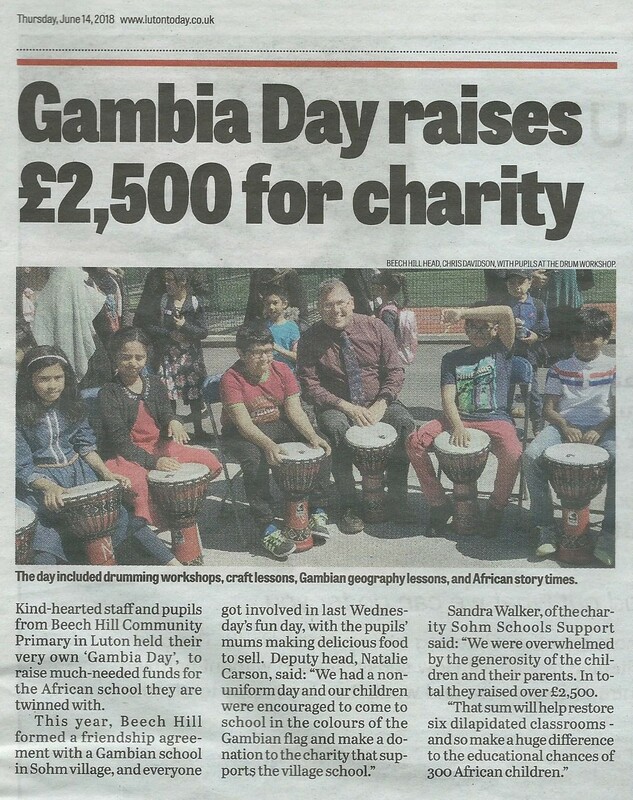 We thank journalist, Jo Gravett, and the paper, for spreading the message in such a positive way. We sent Lamin a copy and he expressed his appreciation: " Thank you John. we are very much grateful to you. This is wonderful." I would like to inform you that our school has come top in the recently concluded Cluster MINI CCM (Consultative Committee Meeting). The aim of this exercise is to gauge the performance of the school in the area of Leadership and Management, Curriculum Delivery, Pupils' Performance and Learner Welfare and School Environment. Out of the ten schools in the Cluster, including the Upper Basic Schools and the Senior Secondary School, we came out first in ranking. Our performance in this exercise is as a result of your unflinching support to the school. We hope that the relationship we start with our friends grow from strength to strength. Thank you to you all. With love from Lamin. That's all very satisfying and shows how investment can trigger great results. I thought the sentence from Lamin Saidy summed up how development should work: 'Our performance in this exercise is as a result of your unflinching support of the school'. Investment unleashes the inherent potential - brilliant! Praise - and support - indeed, from one who knows! Sohm is, by Gambian standards, a fairly remote village. One of the great challenges is for the children there to become familiar with the wider, outside, world. A couple of events recently have addressed this. Independence day in The Gambia, as in all post colonial countries, is a big occasion for national celebration and pride, and some of Sohm's youngest got a very early taste of it, as the photo below shows. The nursery school celebrated the day in a local village, in a ceremony attended by 140 other nursery schools in the region. The photos shows some of the Sohm contingent at the march past. Meanwhile, one of the Lower Basic school's older girls is making a name for herself in the national athletics arena. There was a national schools' athletics meet at the National Stadium in March, to celebrate the 53rd anniversary of independence. Sohm Lower Basic's Nyima Badjie, representing both the school and its region came second in the high jump for her age group. Nyima, shown below, is a pen pal of one of the youngsters at Beech Hill primary school. She established her mark with almost no training or coaching. Safe to say, if she were in the UK she would already be signed up to a major athletics club and being groomed as a potential competitor in the 2024 Olympics. Sadly, Nyima's talents will not be so well nurtured in The Gambia. Despite, or possibly because, of this, Nyima deserves our greatest congratulations! We have recently received this unsolicited letter of thanks from Lamin Saidy, the acting head teacher of the Sohm Lower Basic school (the previous head, unfortunately, died in January of this year, just prior to our visit to The Gambia. In his own words, he summarises most of what we have been attempting to do to assist his school, over recent years. It is a satisfying read for us. We hope you agree - and thank you for your on-going support to our small charity. 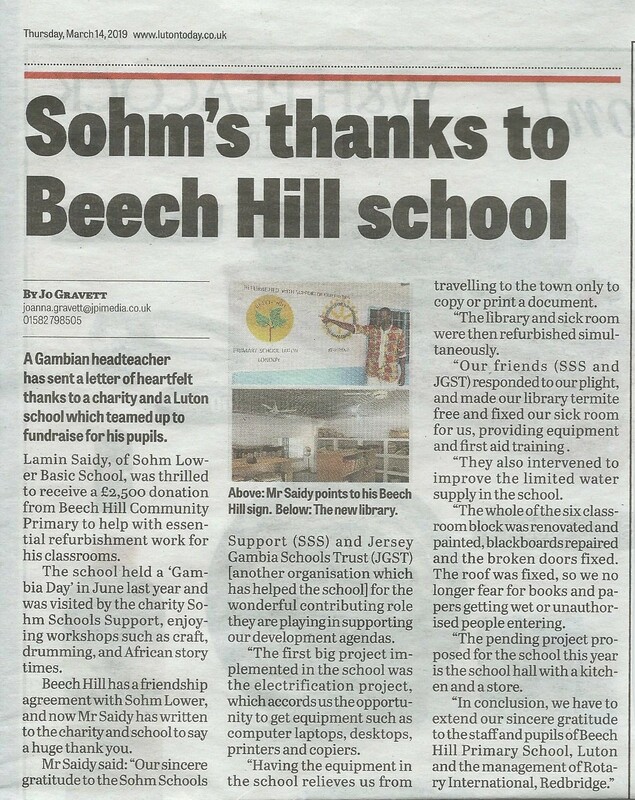 Our sincere gratitude to the Sohm Schools Support (SSS) and Jersey Gambia Schools Trust (JGST) for the wonderful contributing role they are playing in supporting our development agendas. Through the engagement of SSS and JGST in our quest to develop Sohm Lower Basic School into model rural school, a lot has been achieved on the infrastructure and teaching and learning equipment. Each time John and Robin are seen in the school, everyone feels happy, even the pupils. Their every visit in the school is impressive but this year’s visit is particularly very impressive. This is manifested in the way our friends were received in the school. The welcoming involves personalities from the village and the staff and pupils of the school. There was a short session organised purposely to complement the effort of all our friends through John and Robin by the community awarding presents and certificates to John, Robin and Kakai. It is our wish for every partner to have a form of reward but we do not have the capacity to do so but we believe that God will deservedly reward all those who in one way or the other contributing to the development and welfare of our school. Our two friends (SSS and JGST) always listen to our problems and try to make sure that the problems known are no more than a threat to jeopardise our progress. 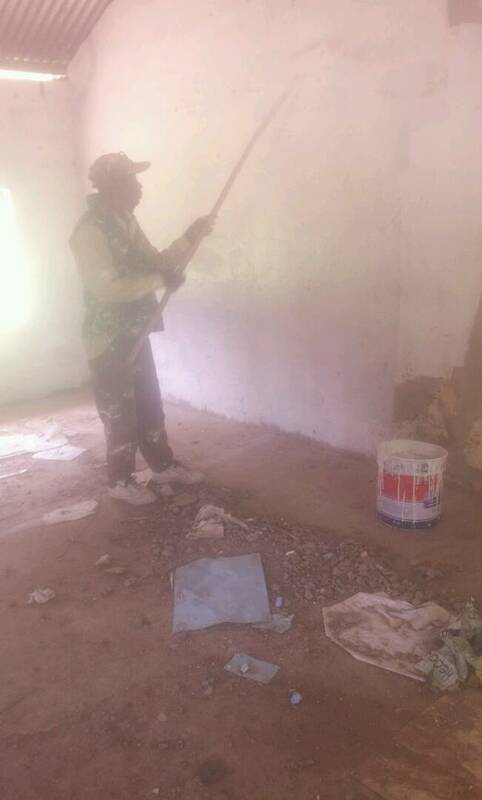 This is how we got improvements on the library, sick room, water supply, toilets, fencing, and mending of the dilapidated classroom block and, of course, the electrification of the whole school. Each of the projects accords us an opportunity to adding a value to our equipment and assets. The first big project implemented in the school was the electrification project before the installation of which we had to travel to the nearby towns to process our documents. The installation of electricity accords us the opportunity to get equipment such as computer laptops, desk tops, printers and copiers. Having the equipment in the school relieve us from travelling to the town only to copy or print a document. The time wasted did not helping the day to day running of the school. Time was wasted and there was reduction in human resources. The one running the errand has to leave a gap on the ground unattended. Today we are not leaving our post only for printing or copying rather, we have our own equipment that we use at our level to do our work. All the facilities we are enjoying today came through the support of our friends SSS and JGST. Following the electrification project was the library and sick room were refurbished simultaneously. Before the renovation took place in the library, there is nothing that we did not do to keep away the termites. All the efforts taken to repel the termites went in vain. For the sick room, there was a space for it, but nothing could be done there at that material point in time (as there were no resources). We have children coming from nearby villages walking a distance of two to three kilometres, whenever they fall sick we have no place to rest them much more to administer a first aid treatment. The first aid kit box was empty with no drugs and no other first aid equipment. This poor sick child had to be sent back home unattended. Our friends (SSS and JGST) felt this situation with us and responded to our plight, making our library termite free and fixed our sick room for us, providing first aid equipment and arranging first aid training for the whole staff. We had only one water source for the school and this single pump was shared with the community. Our friends (SSS and JGST) intervened to improve the limited water supply in the school. We now have a stand pipe at the staff quarters, one at the garden, two for children and one behind the classroom, which children use when going to the toilet. The most recent development in the school is the fencing project and the renovation of six classrooms. These two came at a time we needed them most. There were cracks on the walls, cracks on the floor broken doors and damage on the roof of a classroom. The cracks on the walls affected the blackboards, preventing teachers from writing on the blackboard. The whole of the six classroom block was renovated and painted, blackboards repaired and the broken doors fixed. The roof was fixed, so we no longer fear for books and papers getting wet or unauthorised people entering the classrooms after school hours, to tamper with our materials. Our friends (SSS and JGST) are not only supportive on the side of infrastructure, but are also supportive on the side of stationery. They provide an annual supply of stationery based on what the school needs. The stationery received every year always address our needs, meaning we are getting the required quantity and quality of materials that will serve our teaching and learning needs through to the next year. There is no child in the school without the basic school materials such as: books, pens, pencils, erasers, rulers, sharpeners. Teachers also have vanguards (poster paper), markers, rulers, glue, a laminator, a television set and cello tape, to prepare the learning materials in their classes. The support of our friends does not only stop at the aforementioned assistance they render to us. 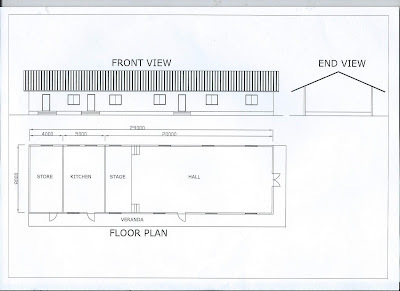 The pending project proposed for the school this year is the school hall with a kitchen and a store. 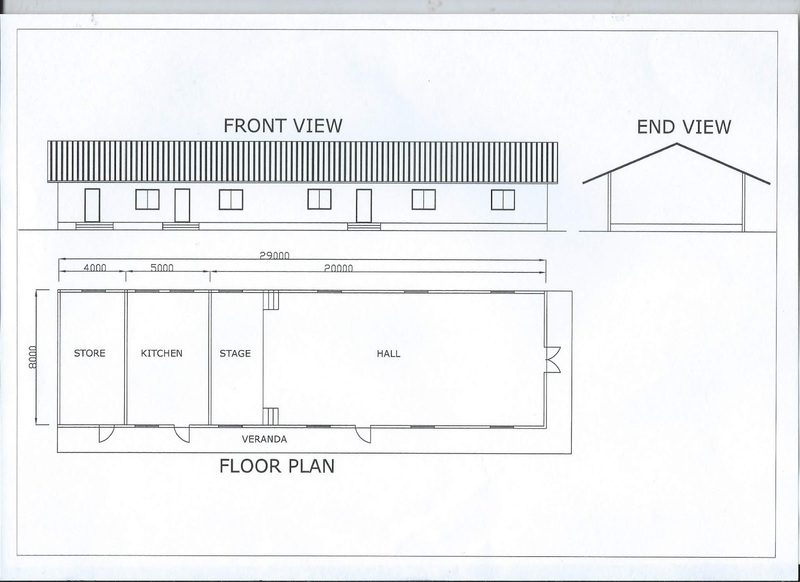 The store, as proposed, will be fully furnished with movable chairs, electrified and fitted with equipment such as projector for school based workshops and meetings as well as audio visual classes. The hall should also have a stage basically for sport, drama, role play and other educational activities. This same hall will serve as the school assembly hall. Another wonderful initiative we have from our friends (SSS and JGST) is that we are linked with First Aid For the Gambia, where we now get our annual first aid supply for the sick room and they arrange biannual first aid training for the teachers. We just had the third supply of equipment and supplies and the second first aid training, on Friday 25th January 2019. A P.O. Box was also opened for the school in February 2019 to make mailing easy and secure for the school. Last year our friends in Luton sent us letters and packages, which, until today, we have not received. 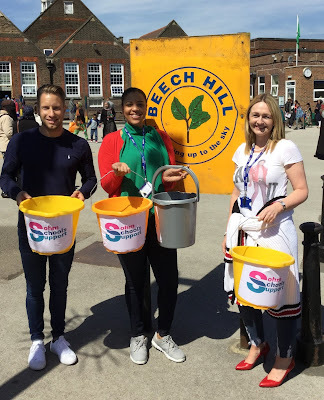 It is in our plans to make good use of the resources at our disposal in a positive way, in order to bring about greater opportunity to attract a culture of being supportive in the day to day running of the school including feeding the school children. We want improvement in our water supply in order intensify gardening and farming within the school. The Mothers' club is an instrumental partner, as far as grooming and caring of school children is concerned. We have high hopes of this club which is already established in the school. We are relying on the able- mothers club to come to our aid, by invitation, to be part of us in the garden to grow more crops and feed our children who will sometimes come to school hungry. The success of this project is assisted by the more efficient water supply with efficient garden tools and farming implements at our disposal. In conclusion, we have to extend our sincere gratitude to the staff and pupils of Beech Hill Primary School, Luton and the management of Rotary International, Redbridge. We would not forget the personalities of John, Robin, Carol, Sandra, Natalie and their Gambian counter Mr. Kakai Sanyang for their unflinching support to make things possible the way they are with us here in the Gambia. We alone can tell how much your support means to us. Everybody knows about your support in our school. Our most successful visit to Sohm, to date, will be the feature of a series of articles over the coming months. The achievements of the trip, however, can be expressed in 10 headlines and photos, below. 1. Given a great welcome by the school. 2. Witnessed transformed classroom block, courtesy of the generosity of pupils from Beech Hill school, Luton and Redbridge Rotary Club. 3. Saw superb delivery of First Aid training to 10 adults and three pupils, plus the delivery of upto date stock of medical supplies, from the ever-excellent First Aid 4 Gambia. 4. Signed off plans for a new 30 metre hall and kitchen block - our biggest project yet - to be built this year. 5. Delivered £1k+ of stationery to meet all needs of 450 pupils and their staff for the next year. 7. Picked up over 90 letters, drawings and photos from the pupils to take to their pen pals in Luton. 8. Sourced potential furniture - with ideas of how to pay for it - for the new hall, for next year. 9. Spoke to Banjul Rotary Club, about possible future co-operation. 10. Tracked down possible future training packages for the staff at Sohm Lower Basic School. Future blogs will add flesh to the bones of the above achievements. As ever, we welcome your comments and donations - to help us continue to change lives in the small Gambian village of Sohm. 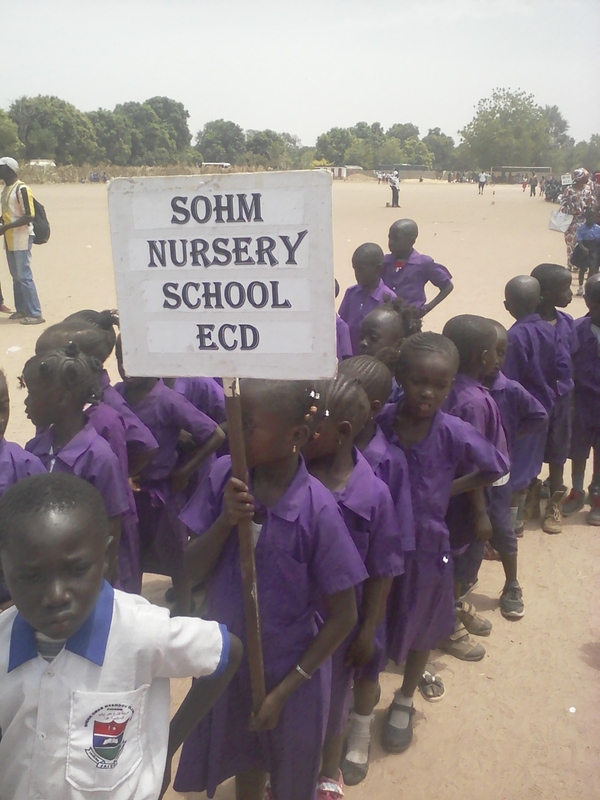 As the new school year starts in Sohm, we are delighted to provide a progress report on our ambitious Sohm 2020 project. 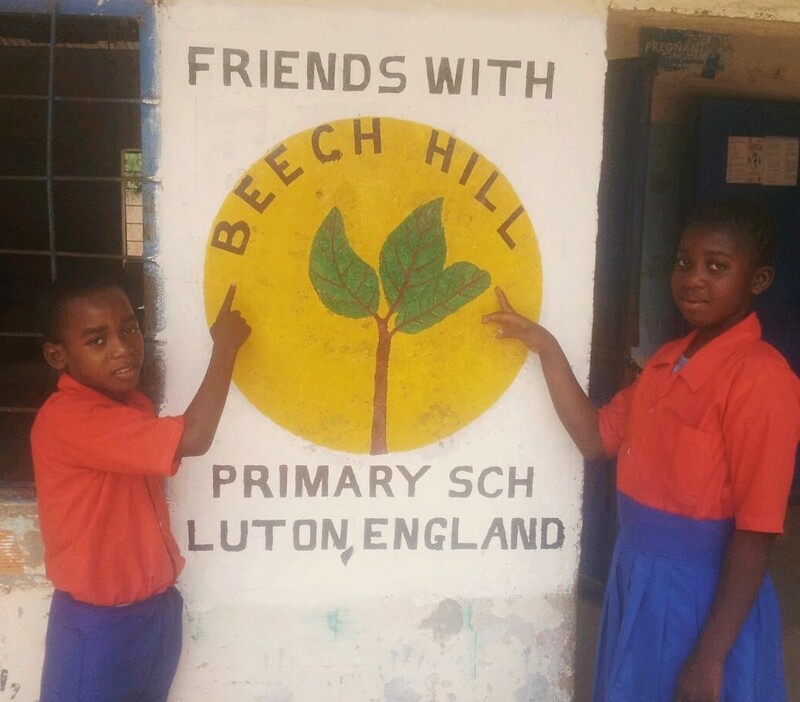 This year we have established two great partnership projects to help raise funds for our charity: Beech Hill Primary school in Luton and Redbridge Rotary club. As a result of this, we embarked on our most ambitious project to date - which we have labelled Sohm 2020. Our object is to raise £20,000 by the year 2020. We have pledged to repair and refurbish six classrooms in a block suffering from serious decay, and to completely replace the school's condemned-as-unfit kitchen and dining hall area with a new kitchen and fit-for-purpose multi- functional (dining, sports, assembly, meeting, prayers, performance etc) hall. Progress to date has exceeded our wildest expectations. As we have previously mentioned, Beech Hill school has established a friendship agreement with the Sohm Lower Basic school. 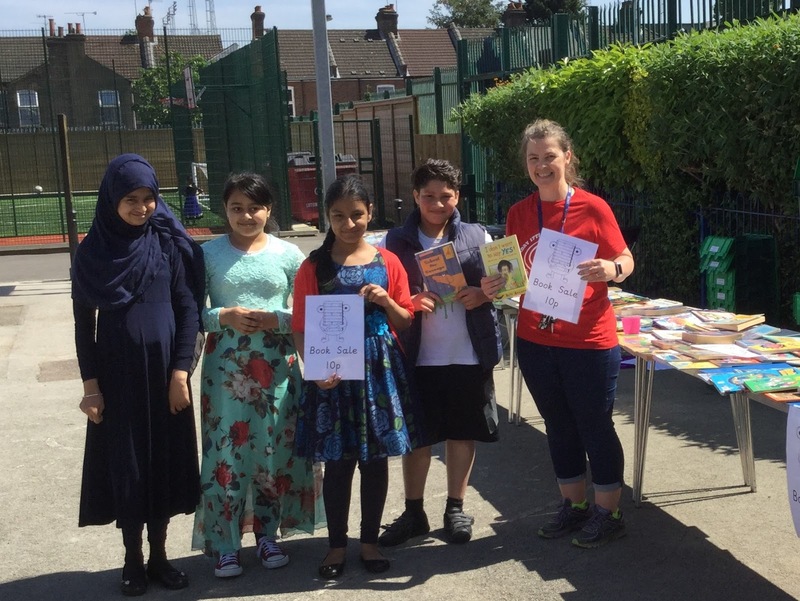 The Luton school held a fund raising day towards the end of last term for Sohm - and have now raised almost £5,000 for the school. 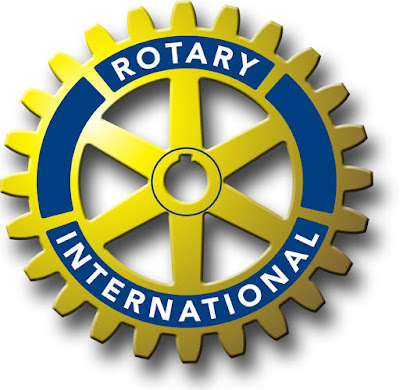 Our good friend Tony Betts has become the President of Redbridge Rotary club this year and nominated SSS as one of his three charities (Rotary International and a local Redbridge one, being the other two). Generous funding from Rotary has meant that we have been able to get a move on. As Sohm LBS returns after the summer break, we are delighted to be able to share that progress, via photos, of the refurbishment of the six-classroom block - nearing completion, as I write. The four photos, below are of the sorry state of the block before the refurbing over the summer break. The next four photos show repining, repairs and painting work under way, over the summer holiday. The six classroom block's refurbishment is ready for re-occupation, after the summer break, thanks to the hard work of contractors - Future In Our Hands - and the generous funding of Beech Hill and Redbridge Rotary. Estimates have been provided for replacing the unfit kitchen and dining hall block, and we are working with the school to firm up their requirements for the replacement block. Below is a reminder of the dreadful state of the block to be replaced. The contractors, meanwhile, have not let the grass grow under their feet on this; they have already demolished the unfit block, ready for constructing the new on. No real pressure on us, then - just another £10k to find over the next eighteen months, in order to replace it! Come on - dig behind the backs of your sofas! 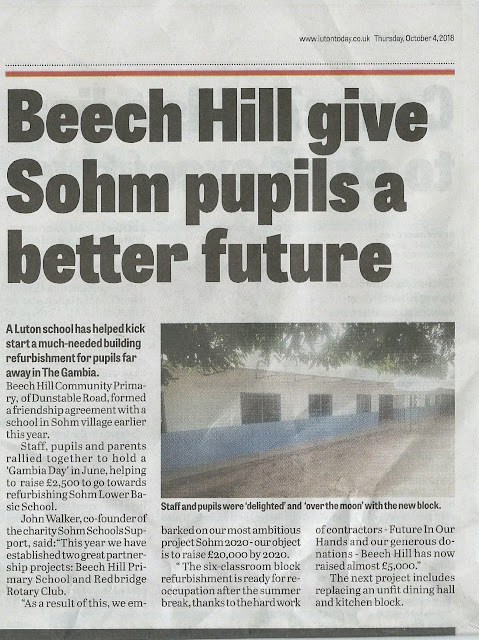 The great work that Beech Hill school, Luton has done in helping restore the classrooms at Sohm Lower Basic school was recognised on the 4 October edition of The Luton Herald and Post.Thanks to them for the coverage - and of course, to Beech Hill for providing them with a great story!